When Emily was just a few months old, we noticed that despite my greatest efforts with regular baby lotion, she was still incessantly itchy a lot of the time! She would get these rashes that would pop up, seemingly out of nowhere, and really bother her. I decided it was time to bring it up at our next pediatrician appointment after the scratching got so bad she was breaking the skin. The doctor prescribed us a pretty common brand here in Canada in the way of eczema daily wash/lotion duos, and suggested to try bathing her just once every couple of days to see if that helped. Since then, we have the bath/shower thing every couple of days (unless of course she was REALLY messy) and used what the doctor suggested. It seemed to work well enough, but I had always wondered if there was something out there that would do a better job. Our experience with this line of products has been quite different, and has helped sooth Emily's skin significantly. Polysporin Eczema Essentials Daily Body Wash uses their unique RELIPID™ formula containing lipids, humectants, and emollient and botanical blends to help retain moisture. It is soap/fragrance free, and moisturizes while gently cleansing even the most delicate skin. The first thing that stood out to me about the body wash was the fact that it lathered. The other brand didn't lather at all. I would use more just to make sure she was clean. It is getting to the point where Em wants to do things herself, and it is a lot easier to get her to wash herself if she can see the bubbles. Our other brand also had a pump top, which I didn't like one bit because it became a game to her. The squeeze bottle design of the Poly products is a lot more convenient for use, and travel both. The Polysporin Eczema Essentials Daily Moisurizer restores healthier skin (dryness/redness) in just a few days, reduces itch after one use, and helps to restore and strengthen the skins natural barrier function. The lotion is a lot nicer too. It goes on smoothly, and spreads out easily. It was quickly absorbed and left Em's skin feeling soft. We apply it after every bath/shower. She hasn't really been scratching, and no more scabs, thankfully. 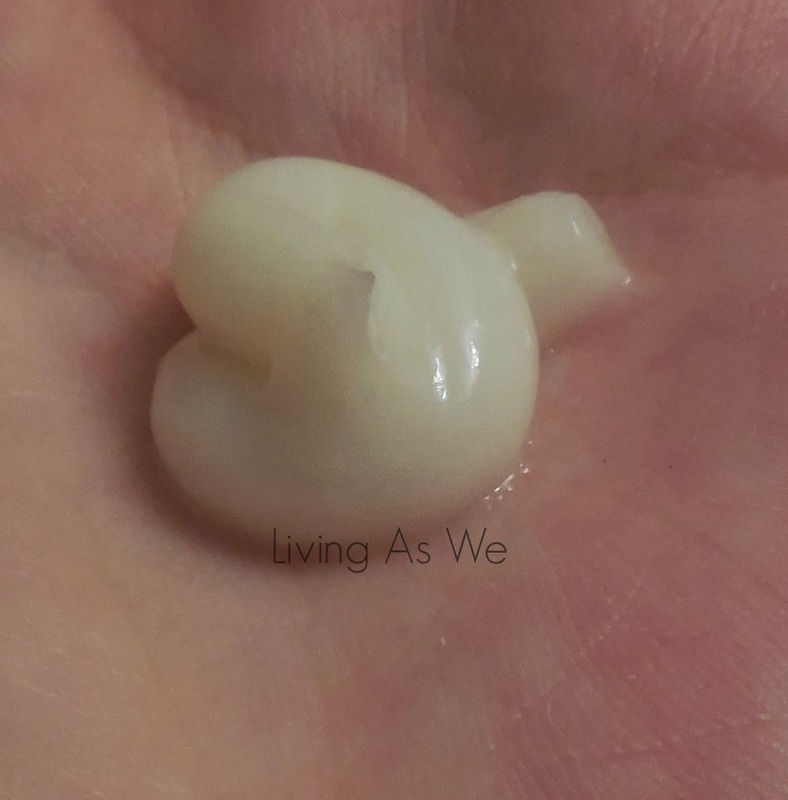 I liked that the lotion was thicker (see below) compared to the one we were using previously. It went on more evenly, and there was a noticeable difference. The other brand, I had to use a ridiculous amount of the moisturizer and she would still be itchy. For those extra irritated days, there's also an Anti-itch cream, but since starting with the Poly line, we haven't had to use it yet. I'll be sure to let you know how it works should we ever need it. It can be used on children ages 2 and up, and works to relieve any eczema flare-ups that may occur. Do you know someone who deals with eczema? You can find more info here. 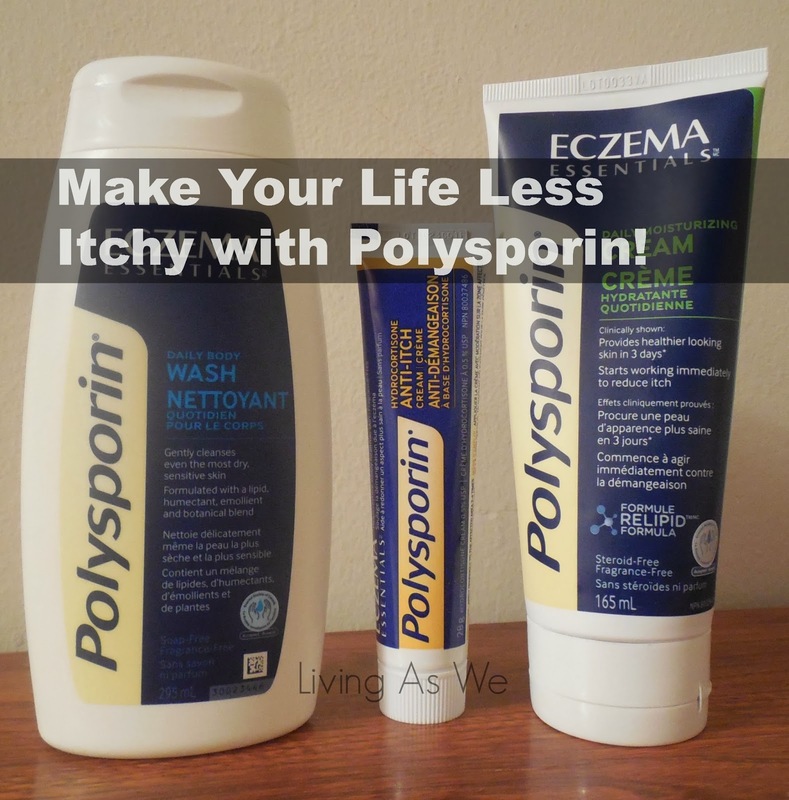 Disclosure: I am part of the POLYSPORIN® Eczema EssentialsTM Blogger Campaign with Mom Central Canada and I receive special perks as part of my affiliation with this group. The opinions on this blog are my own. Oh, I haven't seen this in the drugstore before. Such a great idea! It was a new one to me too. I've never seen this before---my daughter deals with mild eczema we've always used coconut oil. Up until this review, I hadn't seen it before either. I've heard great things about coconut oil too. I've heard of this before but haven't tried it. I want to though. I've never had issues with eczema, but my son has this one really dry spot on his legs that hasn't gotten much better over months of applying regular lotions. I have to look out for this because i have mild cases of eczema especially in the winter. y Sun Went Through This I Wish I New About This Product Then I Could Of Really Used It! Thanks for stopping by. I wish it would have been around for your son too! A friend just mentioned she was diagnosed with eczema on her finger. I will tell her about this right away. Thanks so much! Thanks for sharing, I have a friend who has eczema! Hope this helps! Thanks for reading Emily. Dealt with eczema for many years, mostly on my hands bad enough I could peel the skin like a blister. When I worked out heavily, I would get a break out on my lower back where the top of my underwear sat. The anti-itch cream and moisturizer would be awesome to try! This def must be new, havent seen it beofre, But Im def buying, I get it really bad on my arms/hands, while my daughter gets it on her legs.